Here are a few of the magazines, newspapers, and books in which my work as an Internet marketer has been profiled. 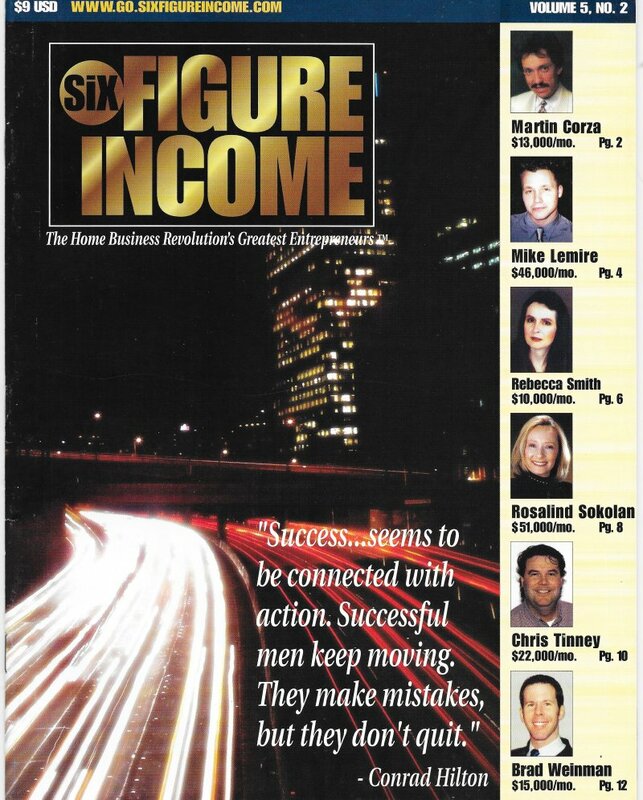 My first interview was in April 2002 with Six Figure Income Magazine in an article entitled, “The Home Business Revoltion's Greatest Entrepeneurs“. This interview revealed most of my business strategy. Although the specific interview is no longer available, I've arranged free access to IMC's exclusive “Secrets To Their Success” Private Web Site, just for you. 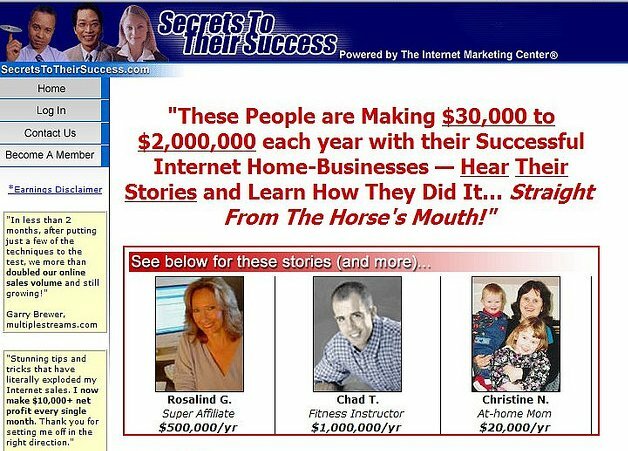 Learn the private techniques and strategies of “Mom & Pop” web sites that are earning incomes in excess of $100,000 to $600,000 a year like…mine and dozens of others. 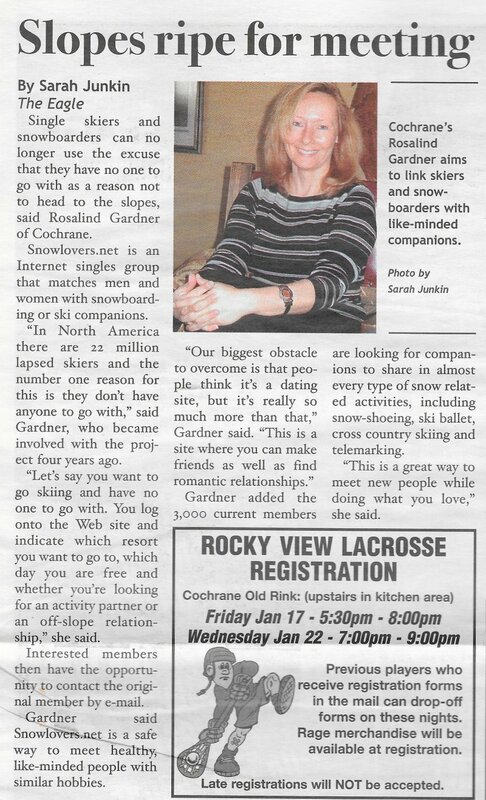 Slopes Ripe for Meeting was a Cochrane Times newspaper interview in December 2002 about a matchmaking site of a different type. Snowlovers.net was a site that matched snowboarders and skiers based on gender, locale, planned resort visits, compatibility and other factors. Although the site was a huge hit amongst its members, the project itself was proof positive that not all partnerships are destined to succeed. On the positive side of this equation, one of the partners – Joel Bolton remained a good friend and later became my virtual assistant. I was interviewed for the Premier of Revenue Magazine, the first (and still the only) glossy magazine for affiliate marketers. Now an industry standard, Revenue magazine delivers the most integrated and personally relevant information to today's online marketers. Editorial intelligence is focused on all aspects of the online marketing experience including, key business strategies, innovative marketing methods, effective online advertising techniques and emerging trends in technology. Since that interview (and a second listed below), I now write the “Affiliate's Corner” column for Revenue Magazine. Revenue magazine is published by Montgomery Media International (MMI), a division of Montgomery Research, Inc.
By result of the “Secrets to their Success” interview, more information about my work as an Internet marketer appeared in the November 2003 edition of Small Business Opportunities magazine. In the January 2006 issue of Revenue Magazine did a ‘what are they doing now?' follow-up to the “Five Who Thrive” article (see above) that was featured in their premier issue. Stanley Tang is a 13 year old successful Internet entrepeneur 14 of the world's most successful Internet marketers about ‘their rags-to-riches stories'. Well, my story isn't exactly rags to riches but it does appear in eMillions. Real Success Without a Real Job: There Is No Life Like It! Here is a portion of its product description from Amazon. Above all, get the most out of your life —personally and professionally! This revolutionary book is for those millions of organizationally averse people who would like to break free of corporate life so that they have complete control over their lives. Throughout the book you will read about several ordinary individuals who have attained extraordinary success without a real job. International best-selling author Ernie Zelinski also uses experiences from his own life to show how the powerful success principles emphasized in this book can help you joyfully avoid the shackles of the corporate world for the rest of your life. Positive, lively, and captivating, Real Success Without a Real Job is designed to help you live an extraordinary lifestyle that is the envy of the corporate world — there is no life like it! Check out Real Success Without a Real Job: There Is No Life Like It! Joel Comm is popularly known as the King of Adsense, having written the best-selling book “The AdSense Code: What Google Never Told You About Making Money with AdSense“. You'll find information about me and my work on pages 65, 83, 108, and 126-8. Yanik Silver is the leading expert on creating automatic, moneymaking websites. He has sold more than $10,000,000 of information products online, despite minimal knowledge of web design and HTML. I'm honored to call him a friend and when he asked me to do an interview for his first book, I was thrilled. Here's a testimonial that Yanik received from legendary marketer, Ted Nicholas. Earn Money in Retirement: How to Draw on a Lifetime of Experience to Supplement Your Pension by Jim Green. Mr. Green republished an article that I wrote in his book. Last but not least, here is a list of my conference appearances and radio interviews.